The US Navy's Pacific Fleet's carriers have gained a new fast jet squadron in the form of VFA-86 Sidewinders which has moved to Naval Air Station Lemoore. The squadron will also trade in their F/A-18C Hornets and transition to the F/A-18E/F Super Hornet which is expected to be completed by the end of this year. 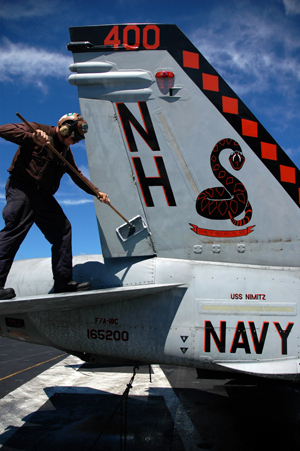 The Sidewinders have already made a WestPac deployment with the USS Nimitz (CVN-68) in 2009/2010, even though at the time the unit was based on the opposite coast at Marine Combat Air Station Beaufort, South Carolina.